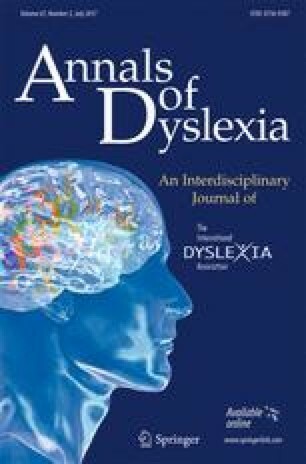 The existing literature on developmental dyslexia (hereafter: dyslexia) often focuses on isolating cognitive skills which differ across dyslexic and control participants. Among potential correlates, previous research has studied group differences between dyslexic and control participants in performance on statistical learning tasks. A statistical learning deficit has been proposed to be a potential cause and/or a marker effect for early detection of dyslexia. It is therefore of practical importance to evaluate the evidence for a group difference. From a theoretical perspective, such a group difference would provide information about the causal chain from statistical learning to reading acquisition. We provide a systematic review of the literature on such a group difference. We conclude that there is insufficient high-quality data to draw conclusions about the presence or absence of an effect. We would like to thank Nic Badcock and Robert Ross for discussions about meta-analyses, and Robert Ross, Anne Castles, and Max Coltheart for helpful comments on earlier versions of this manuscript. We are further grateful to all authors who replied to our queries. This project was supported by a post-doctoral grant to XS by the Fondazione Marica De Vicenzi and Università degli Studi di Padova. Button, K. S., Ioannidis, J. P. A., Mokrysz, C., Nosek, B. A., Flint, J., Robinson, E. S. J., & Munafo, M. R. (2013). Confidence and precision increase with high statistical power. Nature Reviews Neuroscience, 14(8). doi: 10.1038/nrn3475-c4. Gelman, A., & Loken, E. (2014). The statistical crisis in science: data-dependent analysis—a “garden of forking paths”—explains why many statistically significant comparisons don't hold up. American Scientist, 102, 460–465. Retrieved from http://www.stat.columbia.edu/~gelman/research/unpublished/p_hacking.pdf. Ioannidis, J. P. A. (2005). Why most published research findings are false. Plos Medicine, 2(8), 696–701. doi: 10.1371/journal.pmed.0020124. Ise, E., & Schulte-Körne, G. (2012). Implizites Lernen und LRS: Spielen Defizite im impliziten Lernen eine Rolle bei der Entstehung von Schwierigkeiten im Lesen und Rechtschreiben? Lernen und Lernstörungen, 1(2), 79–97. doi: 10.1024/2235-0977/a000011. Meehl, P. E. (1990). Why summaries of research on psychological theories are often Uninterpretable. Psychological Reports, 66(1), 195–244. doi: 10.2466/Pr0.66.1.195-244. Roever, C., & Friede, T. (2016). Package ‘bayesmeta’. Retrieved from https://cran.r-project.org/web/packages/bayesmeta/bayesmeta.pdf. Rouder, J. N., Speckman, P. L., Sun, D. C., Morey, R. D., & Iverson, G. (2009). Bayesian t tests for accepting and rejecting the null hypothesis. Psychonomic Bulletin & Review, 16(2), 225–237. doi: 10.3758/Pbr.16.2.225. Royall, R. M. (1986). The effect of sample-size on the meaning of significance tests. American Statistician, 40(4), 313–315. doi: 10.2307/2684616. Schmidt, F. L. (1996). Statistical significance testing and cumulative knowledge in psychology: implications for training of researchers. Psychological Methods, 1(2), 115–129. doi: 10.1037//1082-989x.1.2.115. Simmons, J. P., Nelson, L. D., & Simonsohn, U. (2011). False-positive psychology undisclosed flexibility in data collection and analysis allows presenting anything as significant. Psychological Science, 22(11), 1359–1366. doi: 10.1177/0956797611417632. Simonsohn, U., Nelson, L. D., & Simmons, J. P. (2014b). P-curve: a key to the file-drawer. Journal of Experimental Psychology: General, 143(2), 534–547. doi: 10.1037/a0033242. Treiman, R., Kessler, B., Zevin, J. D., Bick, S., & Davis, M. (2006). Influence of consonantal context on the reading of vowels: evidence from children. Journal of Experimental Child Psychology, 93(1), 1–24. doi: 10.1016/J.Jecp.2005.06.008. Viechtbauer, W. (2010). Conducting meta-analyses in R with the metafor package. Journal of Statistical Software, 36(3), 1–48. Retrieved from http://www.jstatsoft.org/v36/i03/.